Without the power to restrain individual freedoms, US city and regional planning institutions are weak. This is painfully true in northern California’s Silicon Valley -- a narrow north-south stretch along the southwest shore of San Francisco Bay. SV is hemmed in on the west by the Santa Cruz Mountains. West of them is the precious, lightly developed Pacific Coast. Most of Silicon Valley is a string of suburbs stretching south from SFO Airport in the north ending more or less in San Jose. To say that this is hot real estate is no exaggeration. It is home to a techno-corporate powerhouse that generates cutting-edge thinkware and generates thousands of jobs This makes for very pricey real estate with little room to grow except up. America’s political culture is one of individual freedoms and minimal local governance. Physically, most of America is a spread of parking lots and highway-oriented development spilling out with residential neighborhoods of modest density that spill out into scattered housing. This is so unlike the tightly regulated cities and towns of Europe. 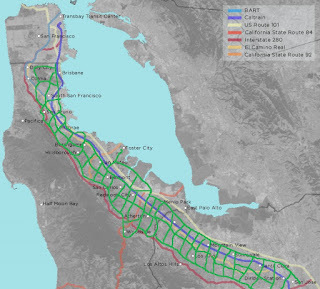 The Bay Area has a metropolitan planning organization (MPO) known as the MTC. The Metropolitan Transportation Commission oversees a highly structured planning process for the region’s transportation infrastructure -- essentially the highways and mass transit. In theory MTC works toward the future well-being of a vast area, Silicon Valley being one sub-region. Like most states, California has no coherent statewide development policy. Silicon Valley’s economic success in the absence of proactive planning has blown the cost housing sky-high and choked up the highways with traffic. Where is a Sense of Vision? Despite attempts by INIST, San Jose State’s Mineta Center and pod activist Rob Means, local and regional officials in Silicon Valley don’t think much beyond five years. MTC’s Federally mandated process is the exception, weak though it be. Where is the Master Planner who can boldly explore a full array of development scenarios with different housing types, such as high-rise along the Bay or along Santa Cruz Mountain ridges? Where is the transport strategist looking at non-road ways to move people around? Indeed new modes of transport are available to shape growth and reduce auto dependency. Trans.21 proposes extensive podcar networks inter-connecting scores of the many places where people want to go. The overall service is so satisfying that 25-50% of all travel will be attracted. That compares to transit’s share of 3-5% today. Think of how podways will alleviate street and highway congestion. Savvy citizens will ditch car ownership and save lots of money. With the right public policies, these savings can be the base from which society can pay for pod infrastructure. The accompanying map shows a hypothetical pod network in green. It includes several hundred miles of guideway (some could be on existing, protected streets) and several hundred stations. 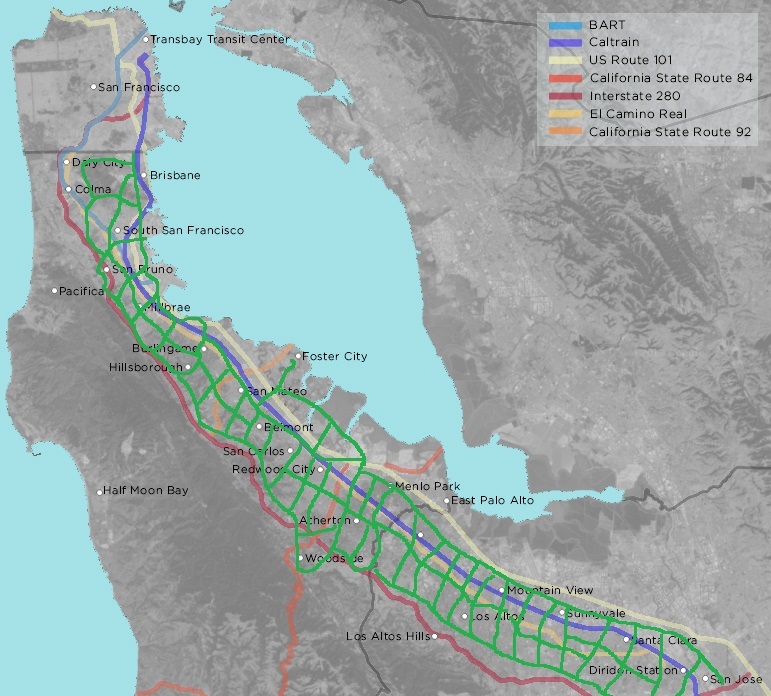 It would distribute from and feed into the several existing Caltrain stations shown in blue. Ridership on it has grown recently. Pod feeders would at least triple today’s ridership of 65,000 daily trips. As for the political reality of such a future, the MTC is not even thinking of such a scenario. Its vision is more narrowing focuses on a recently announced $700 million project to electrify the 84km Caltrain line That’s just to replace signaling! The MPO process tells us that this is a good investment that also happens to enrich well-placed consultants and contractors. Can MPOs -- MTC and the many others spread across the US -- open up to podcar futures?